VR treadmills are possibly one of the daftest things on the planet. Yes, they sort of avoid that classic virtual reality hazard of tripping over headset cables and falling flat on your face, offering a way for TRUE VR immersion seekers to feel like they’re really ‘in the game’, so to speak, but a) they’re crazy expensive, b) take up mountains of room, and c) you still look like an utter numpty running about on a treadmill with a pair of VR goggles strapped to your forehead. 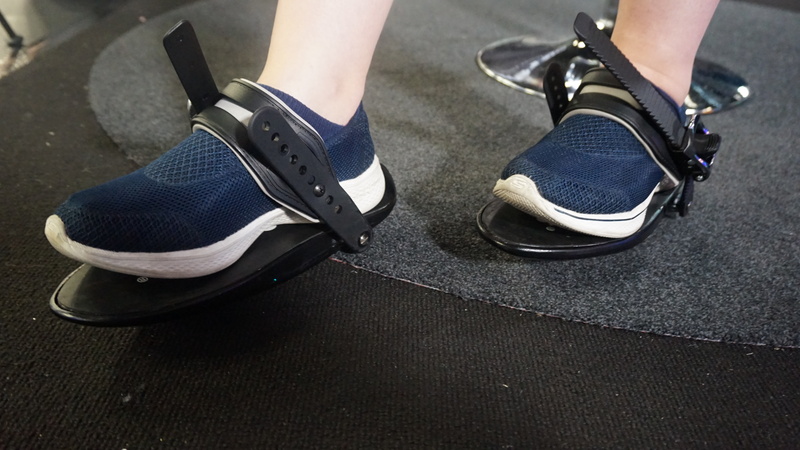 Cybershoes’ eponymous VR sandals, on the other hand, will still make you look like a bit of a numpty, but at least these let you run around virtual environments from the comfort of your own spinny chair, and are set to cost a heck of a lost less than their big, bulky rivals when they eventually launch in early 2019. Here’s how I got on after trying out a pair for myself at Gamescom last month. 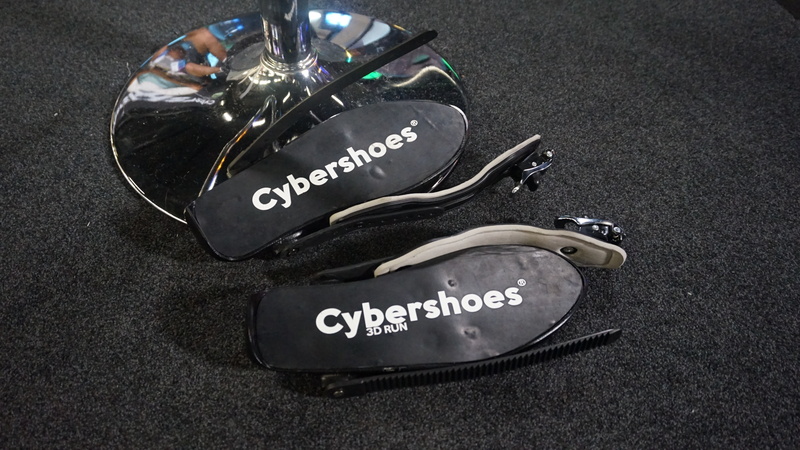 There are still a number of hurdles involved in using a pair of Cybershoes. For starters, you really need a proper spinny/wheelie/swivel chair of your choice – preferably one with a low back – to make the most of them, and unless you happen to have a handy suspension arm contraption that can keep those pesky headset cables out of the way above your head as I did in my demo, there’s still the age-old problem of potentially tying yourself in some quite literal knots as you trot round in circles. But! In theory, they’re a surprisingly convincing bit of kit, even if most of my three minute jaunt around Doom VFR‘s space station was spent getting lodged on various bits of safety rail furniture because my brain couldn’t get the hang of trying to walk while still technically sitting on a chair. 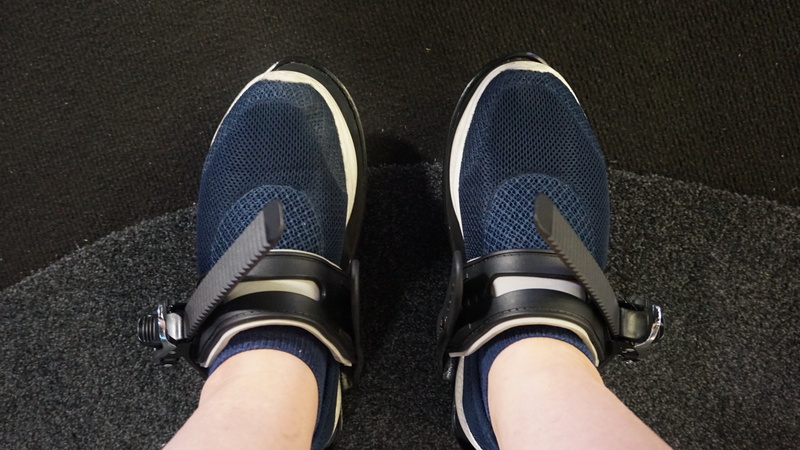 It’s a weird sensation, cycling your feet around while sitting down, and for several minutes it felt like my Cybershoes had been secretly swapped out for a pair of rollerskates – one step sending me careering towards the opposite end of the room at 100 miles an hour. I eventually got my head round it – all too close to the end of my demo, unfortunately – but even that brief lightbulb moment was enough to confirm that they’re a much more natural (not to mention less tiring) mode of moving around in virtual reality than, say, walking on the spot standing up, or using one of those aforementioned treadmills. Crucially, my Cybershoe experience didn’t make me feel like redecorating the surrounding demo booth with the remains of my lunch, which came as something of a surprise. I remember the rather slow and sedate viking fantasy adventure Fated: The Silent Oath being a notorious stomach lurcher when I tried nudging my way through its leafy forests and snowy mountain tops using traditional analogue sticks when it first came out in 2016, but even more recent 360-degree VR games such as noir thriller Wilson’s Heart have continued to test the upper limits of my clearly fragile digestive system. It’s no wonder, then, that so many developers have since opted for the classic ‘point and warp-click’ method, which I’ve seen used to great effect in clever things such as Budget Cuts and Robo Recall. And yet, as much as I like not having the ghost of my chicken tikka and salad wrap lodged in my throat at all times while playing VR games, it’s still not quite as convincing, or indeed immersive, as literally every other game we play on a daily basis. Provided the Cybershoes team get it right, however, all that may well change – especially if their planned Kickstarter this month goes off successfully. In truth, the one-size-fits-all pair I tried look quite far off from being a finished product, but even this version has come a long way from the initial prototype, according to Bieglmayer. He also hinted that there may be other backer options that come with additional bits of equipment, too. I’ll be intrigued to see how Cybershoes get on over the next couple of months. While I don’t see every VR enthusiast immediately rushing out to buy their own pair of magic roller sandals, I hope they gain at least enough traction to make this mad venture worth it. It’s certainly more appealing to me than the rigmarole of trying to fit a treadmill into my house, and considerably cheaper to boot. If they can bundle in one of those cable suspension arm things as well, they’ll be flying. If you’ve like to keep track of their progress, or (if you’re really keen) sign up for alerts surrounding their upcoming Kickstarter campaign, head over to Cybershoes’ website.